The people of Okurase have a vision of African villages with safe water and proper sanitation, economic self-sufficiency, improved health and nutrition, increased educational opportunities, access to the Internet and technology and using renewable energy sources. Through six key objectives, we work to accomplish this vision. These overarching objectives are focused on transforming lives by creating collaborative, sustainable, and integrated solutions with a particular focus on women and orphans & vulnerable children. Cultural Exchange - Teach about the unique art, dance, and music culture of Ghana and learn from those we teach. Economic Self-Sufficiency - Support economic growth through relevant, comprehensive skills and vocational training and guide small businesses. Education and Technology - Establish a skills and vocational training program and nursery to senior high school integrated with technology to increase educational opportunities. Health and Nutrition - Provide access to quality health care and promote health and nutrition programs to reduce illnesses and early mortality. Nkabom Centre - Build the Nkabom Centre, an environmentally friendly community center envisioned by the people of Okurase, using local resources. Water and Sanitation - Maintain a safe, clean water system, implement a sustainable toilet system and establish a pattern of environmental cleanliness. Under each of our six main objectives are specific programs that help to further that objective. A key underlying principle of Project OKURASE is the recognition that the people of the village know what is best for improving their lives and how to attain sustainability. Thus, all programs are locally determined and locally led. While external collaborators are respected and valued, the elders and leaders who live in the village have the ultimate authority about whether a program will be initiated and how it will be adapted to the culture of the village. Outside collaborators offer assistance with resources and ideas and the village residents contribute labor (sweat equity), and other resources when possible. Each of the programs under the six main objectives are further broken into a series of projects. The successful completion of these prioritized projects helps us move our programs forward to completion and thus helping us work toward the achievement of our objectives. Afia -Afia is a beautiful loving child who's mum died in childbirth. 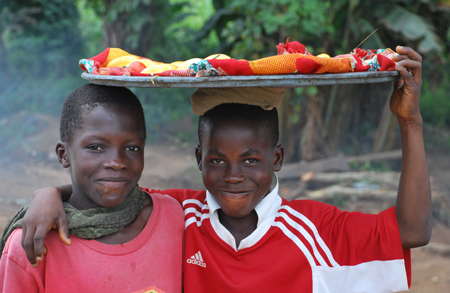 Francis - Francis is a 13-year-old child from Okurase, Ghana. He has been suffering loss of vision since an early age. Over the past 5 years many have worked diligently in Ghana and in the United States to attain proper diagnosis and intervention for Francis. 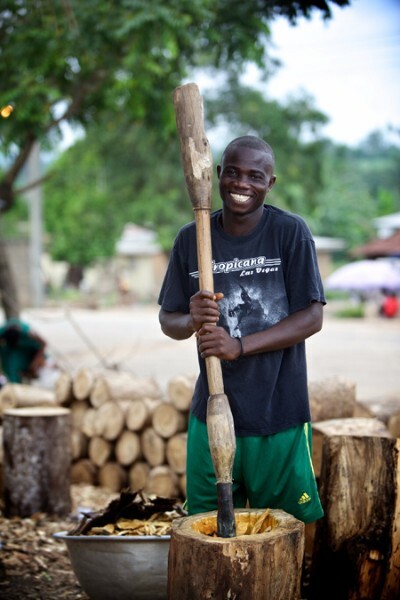 Kingsford - Kingsford is a 15 year old boy who lives in Okurase with his mother, stepfather and two younger sisters. His parents brought him to the Project OKURASE Village Health Outreach in 2016 because he had lost the ability to walk. Explore the many ways to be involved with helping the people of Okurase. Sign up for our e-mail newsletter and join our social community so you'll always know what's happening. These small actions will help spread the word about our cause and help us make a difference.